Well, I admit I am not that enthusiastic about browsing through books tagged as romantic fiction. I often end up picking the ones that are formulaic, one-note and boring.. with vapid characters that you don’t care much for throughout the book. However I do have some sub-genres that I really like, one of my favourites being historical romance. Especially the ones set in the early 1900s. 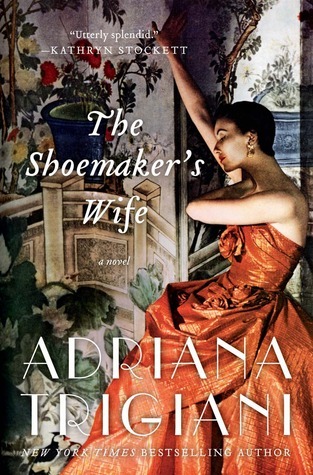 And at the outset, The Shoemaker’s Wife did seem to have the kind of elements that I like reading in a love story.. or any story – Rich cultural setting, strong-willed characters, vivid descriptions of landscapes, journey across continents and well.. a lot of good people with good ethics and ..let’s just say, if you want to take a break from books with grey characters, amoral tendencies, and tragic lives, then The Shoemaker’s Wife might be the book for you. It does get a bit mawkish though but I will get to that later. Ciro and his brother grow up in a convent after their mother, unable to take care of them, leaves the two in the care of the nuns. During his mid-teens, he meets Enza who lives in a neighbouring village with her parents and siblings. Both Ciro and Enza immediately feel a sense of comfort and companionship with each other. That singular, chance meeting is something that both cherish and reminisce about later. Sadly, that is the last time they encounter each other in Italy. Unknown to the other, circumstances force both of them to immigrate to America, search for jobs and rebuild their lives. Ciro starts apprenticeship with a shoemaker and excels at the craft. Enza puts in long hours at a blouse factory. Over the next few years, call it by the design of fate or coincidence, they do end up meeting each other sporadically. But when Enza’s exciting career prospects as a seamstress beckons her from another town and Ciro enlists himself to fight in the war, it begins to look improbable that their love does have a future. There are a lot themes in this book that I loved reading about. There is an underlying melancholy among Ciro, Enza and the other Italian immigrants who continually miss the mountains, green fields, open air, and blue lakes of the alps back home. Who might never see their families again for years. This was the time when the only mode of communication was letters. Ciro and Enza get by with that and treasure every correspondence with their folks. But they are also grateful for the opportunities America provides them. And work hard and don’t take it for granted. And there were a lot of insights delicious expositions about food, family, music, fine arts and the inherent grace and beauty of the Italian heritage and landscape . And some reflective thoughts. Between Ciro and Enza, I think I liked Enza more initially. She was practical and just so sure of what she wanted for her family and herself – in that order. But when she finally makes an impulsive decision for herself, I found it a bit jarring and uncharacteristically insensitive of her towards someone else. And just when I was beginning to think, “Well, nobody is perfect… “ , Trigiani slips in a nugget about the goings-on in that character’s life to somehow just justify that Enza’s choice was “right” and she and all her near and dear ones are perfect. I think that slowly began to tire me towards the end of the book.. that everyone is so nice and wonderful .. with even nicer and more wonderful friends (And that fact is explicitly hammered into our heads). It was a nice cozy read, but I would have liked if there were a bit more conflicts… or well.. just something to stir things up. I like neat, happy endings.. but I find it a bit boring if the book chugs along to a neat, predictable, happy ending. “Hope is a wonderful thing. It has no memory. It fills you with possibility. Whatever your imagination can conjure, hope will design and deliver”.